Easily find your way around Aintree University Hospital using the Wayfinding app just released by Innove Solutions. By mapping out the entire hospital and making extensive use of photographs we have built on our highly successful Southport Hospital Wayfinding app to make it easier for patients, visitors and staff to find their way around this large hospital in Liverpool. The app also contains key information on the hospital as shown below and can be downloaded from The app Store or Google Play by simply searching for “Aintree Hospital”. 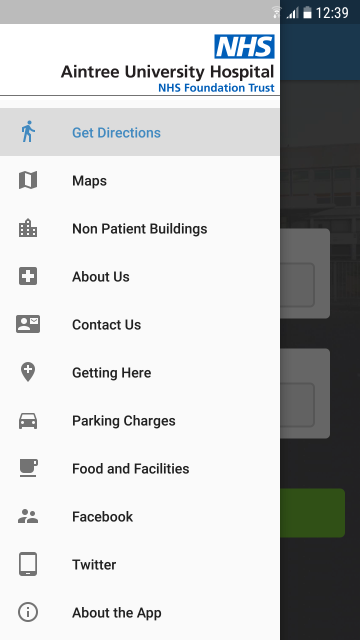 The app can easily be adapted for any hospital or large site and requires very little input from staff on site as we have a dedicated team that carry out the mapping and data collection. If you would like a Wayfinding app for your organisation then please get in touch.